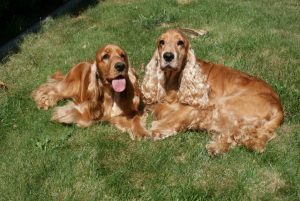 The English cocker spaniel is volatile, sociable, careless and sporting dog. This initially hunting breed needs a lot of movement, mainly if he adores food. He loves forests, fields, meadows and mainly water. He is indefatigable. The intelligence, the goodness and the caginess are connected together in this dog. He is a faithful and excellent guard. He is a skillful working dog and also favorite fellow.